The Federation for Future Internet Research and Experimentation (Fed4FIRE) is an Integrating Project (IP) under the European Union’s Seventh Framework Programme (FP7) in the context of the Future Internet Research and Experimentation (FIRE) programme. The project with seventeen partner organisations from 8 countries started in October 2012 with duration of four years. Fed4FIRE is bringing together key players in Europe in the field of experimentation facilities and federation tool expertise and development who already play a major role in most of the currently running and previous FIRE facility projects. Fed4FIRE will develop a common federation framework that will be widely adopted by different experimentation facilities and different experimenter communities in the area of Future Internet research. The framework will support powerful experiments, experiment life-cycle management, detailed monitoring and key aspects of trustworthiness. Experimentally driven research is considered to be a key factor for growing the European Internet industry. In order to enable this type of RTD activities, there are a number of projects for building a European facility for Future Internet Research and Experimentation. Each project targets a specific community within the Future Internet ecosystem. Through the federation of these infrastructures, innovative experiments become possible that break the boundaries of these domains. Besides, infrastructure developers can utilize common tools of the federation, allowing them to focus on their core testbed activities. Recent projects have already successfully demonstrated the advantages of federation within a community. The Fed4FIRE project intends to implement the next step in these activities by successfully federating across the community borders. What is to be tested and how? 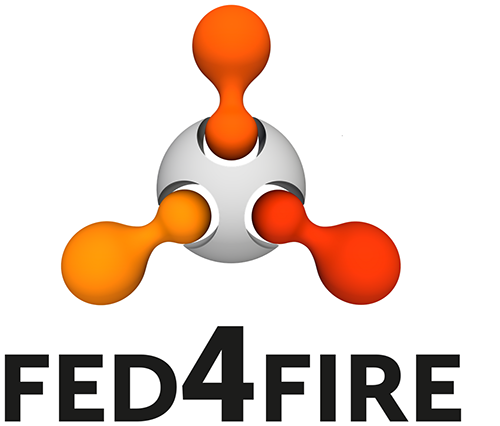 The Fed4FIRE federation framework will enable experiments that combine facilities from the different FIRE research communities. To validate the effectiveness of the framework, researchers from different Future Internet areas will be invited through Open Calls to perform innovative experiments using the Fed4FIRE federation. Their experiences will be used to further develop the federation framework. Similar, additional infrastructures will also be invited to join the consortium. As a continuation of FIRE projects like Panlab/PII, Onelab, OpenLab, BonFIRE, TEFIS, in Fed4FIRE Fraunhofer FOKUS and the Chair of AV at Technische Universität Berlin (TUB) will exploit their knowledge and in-depth expertise on federation mechanisms and utilize and integrate federation tools and systems. Fraunhofer Institut FOKUS leads the Experiment Lifecycle Management work-package and contributes as well by bringing in the FOKUS FUSECO playground experimental facility. The chair of AV at TUB is working on resource description, resource discovery and resource provisioning and as well on experiment measurements and monitoring mechanisms. Within Fed4FIRE, the AV group plans to extend its federation framework FITeagle to support the control and management of the whole lifecycle of experiments running across federated experimental facilities. TUB will extend FITeagle beyond resource provisioning in order to support Service Level Agreement (SLA) lifecycle management, from publication over dynamic aggregation, provisioning and monitoring to experiment termination.